A comparison of SimpleMH and Raw Injection can be found in the Injecting Mail page. SimpleMH’s headers are described in the SimpleMH Headers page. Names may consist of letters and underscores. The “a” Mail Class is reserved and may not be created. Two or more underscores may not appear next to each other. For example, “server__a__email” is invalid, but “server_a_email” is valid. 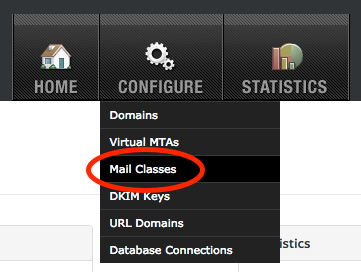 Virtual MTA - The VirtualMTA to assign mail in this Mail Class to. Mailing List ID - The ListID to assign mail in this Mail Class to. Override Default Bounce Address - The Bounce Address to use for mail in this Mail Class. BCC All Messages - Add a BCC to every email sent using this Mail Class. Add Custom Headers - Add custom X- headers to emails sent using this Mail Class. A maximum of 1024 bytes are allowed. Only X- headers may be entered. Track Clicks and Opens - Turns click and open tracking on or off for this Mail Class. Handle Unsubscribe Links - Turns unsubscribe link processing on or off for this Mail Class. Pass Bounce Messages Through - Send a copy of each bounce message back to the original Return-Path recipient. Engine will still process the bounce locally when using this feature. If you enable this feature, make sure that the original Return-Path domains have throttling configurations in place which allows Engine to deliver these bounces as quickly as they come in. Otherwise, the bounce pass through messages could fill up GreenArrow’s queues as they wait to be delivered. That situation has the potential to slow deliveries to a crawl system wide. URL Domain - Choose the URL Domain to use in Click + Open tracking for mail sent via this Mail Class. Archive a Sample of Messages - Archives sample messages to a table in GreenArrow Engine’s PostgreSQL database. Add Message-ID if missing - If the injected message does not include a Message-ID header, one will be generated automatically. Number of Emails to Start Seeding At - Set this field’s value to the daily message volume below which, you don’t want automatic seeding to take place. The field is hidden unless the Automatically seed mailings box is checked. Number of Emails to Finish Seeding By - Set this field’s value to the minimum number of messages that would be sent on a day that automatic seeding occurs. If this field is set to a value that’s higher than the number of messages that are sent, then only a portion of the GreenArrow Monitor seedlist will be sent to. The field is hidden unless the Automatically seed mailings box is checked. When this feature is enabled, GreenArrow Monitor groups all messages for this Mail Class into one campaign per day. This takes precedence over the X-CampaignID header. Convert Text-only Messages into HTML - converts text only messages to HTML. If this box is checked, additional fields appear, which allow you specify an HTML header, HTML footer, the text that should appear for converted links, and regular expression operations to perform before, and after conversion to HTML. 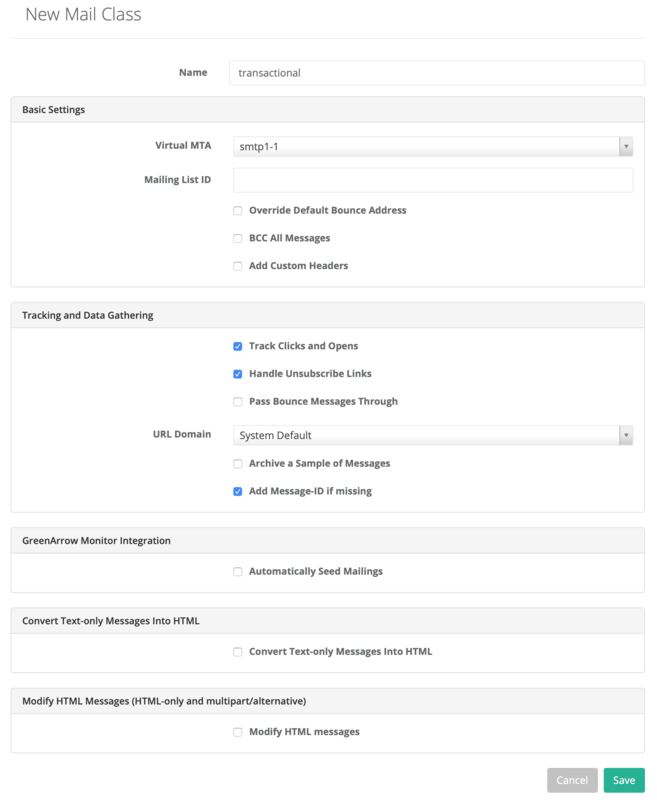 Modify HTML messages - If this box is checked, additional fields appear which allow you specify how you’d like HTML messages to be modified. Fill in the form, then click Save. This form’s fields are described in the Adding a Mail Class section above.